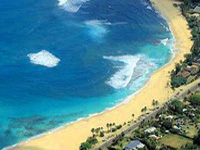 Fly high above the magnificent island of Oahu Hawaii on our Extreme Oahu Doors Off Helicopter flight. 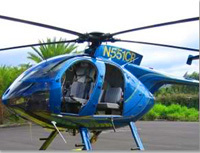 See the famous highlights and landmarks of Oahu from the skies with the doors off of the helicopter. 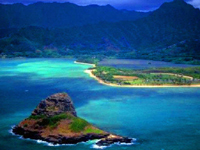 Our Extreme Oahu Doors Off famous highlights and landmarks tour is 45 minutes of flight time and covers Oahu's famous landmarks including Chinaman's Hat, dramatic North Shore Coastline and the impressive 1000 foot Sacred Waterfalls. Take this amazing journey of Oahu which highlights the dramatically beautiful Sacred Falls, a sheer and splendid 1000-foot cascading waterfall. 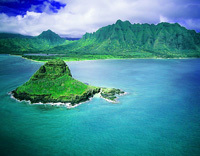 Hover over the impressive Ko'olau Mountains, view stunning Kaneohe Bay, the home to the Chinaman's Hat and take in the famous dramatic North Shore including the massive waves of Sunset Beach and the Bonzai Pipeline; world renowned surfing hot spots. Our State of the Art helicopters are equipped with high visibility window allowing you to have unobstructed views from every seat in the cabin. Air conditioning and a large cabin with ample leg room insures an extremely comfortable flight experience up to six passengers per tour. Each helicopter includes headsets for each passenger and your professional Pilot will provide detailed information throughout the tour.